Just in time for the pumpkin spice latte, the Starbucks drink menu has arrived at The University of Toledo Medical Center. The Market Cafe opened Oct. 22 in UT Medical Center’s lobby. 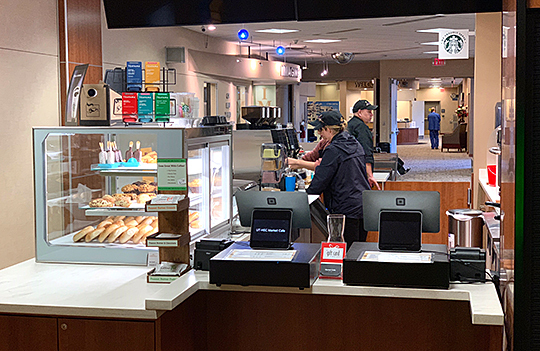 The Market Cafe, which opened Monday in the hospital’s lobby area, is now offering the regular Starbucks drink menu and a selection of bagels and pastries. Over the next two weeks, the cafe will roll out an artisanal menu that features frittatas, craft burgers, pizza and a custom bagel sandwich bar. Preliminary hours of operation will be from 6:30 a.m. to 4 p.m. Monday through Friday. The cafe intends to add Saturday morning hours and expand its weekday hours to 8 p.m. at a later date. “There has been a lot of excitement about us bringing a full-service coffee house to the hospital campus, and I’m proud to say it’s finally here. The Market Cafe is going to be a great addition to the dining options we already offer at UTMC,” said Mario Toussaint, chief experience officer for UTMC. The new cafe was installed by the Bureau of Services for the Visually Impaired, a division of the Opportunities for Ohioans with Disabilities. It will be managed by one of the state agency’s business enterprises. This entry was posted on Wednesday, October 24th, 2018 at 9:30 am and is filed under News, UTMC, UToday .